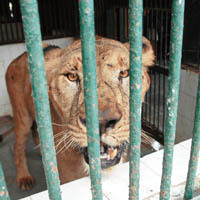 A six-year-old lioness Shobha, at the Sanjay Gandhi National Park (SGNP), killed Harichand Ratna Gingwan alias Dokar, 40, who had entered the cage to feed her. I'm sorry for the death of this poor man. I hope the lioness does not get killed. If I read the article correctly, the animals are released from their cages for the safari and then locked up again? I say, cancel all safaris. Sad for the loss of a human life....prime life! Noted. Kind of a no win situation all the way around. I'm sorry for both the man and his family and the welfare of the animals. Just another reason why animals need to remain in the wild. It is too bad that someone had to lose their life. Sure he died following his passion. silly man ,surely he must have realized what a great risk he was putting himself at ?? i do hope the lioness and her mate do not have to pay the surpreme price because of that man's foolishness? thank you Cher. I am on the lioness side. He proberbly got what he deserved look at the lioness She looks miserable. Put an end to all safaris and keep tigers out of cages. When will they ever learn to stop exploiting these magnificent creatures? Just wondering what upset her & caused her to do this? Not likely it was unprovoked.... That something happened earlier & she was u pset before the attack. Sad, sick world we live in. Surprised it does not happen more often..
should never had entered the cage. sad. very sad. Large animals should not be kept in zoos. They should run free. I'm sorry that this man was killed, but you cannot blame the lioness. She was probably just being territorial or following her instincts. These are wild animals and this is a sublime example of why animals should be free and not held in captivity. I'd be pissed too if I was stuck in a little cage with people leering at me all day! Sad for the loss of a life but that's exactly why animals should be left to live in peace in their own natural habitat. TY Cher. They do these things because they are meant to be free, not caged up. I hope if they do catch Ravindra, they do not hurt him. Please read and share, rescued horses will die without your support.